Too early for Christmas? Maybe just a little–but seriously, there are so many things I love about this kitchen that have nothing to do with seasonal decor that I had to share it with you. This kitchen, featured by At Home In Arkansas, was designed by Tobi Fairley and her mother, Beverly Wells. 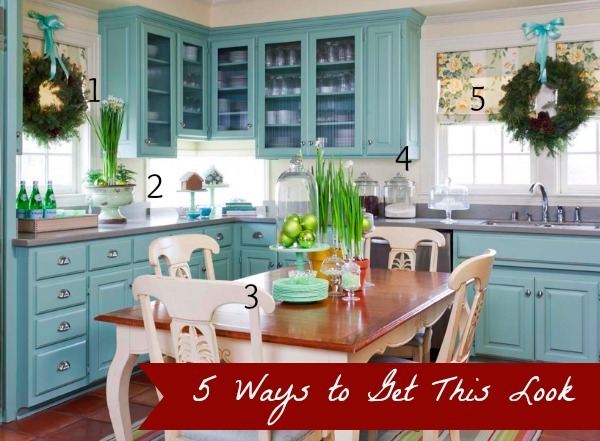 I found some really great tutorials to recreate parts of this Christmas kitchen. Some are perfect for holiday decor, but most can be used year round to get your kitchen looking as bright and welcoming as this one. Enjoy!